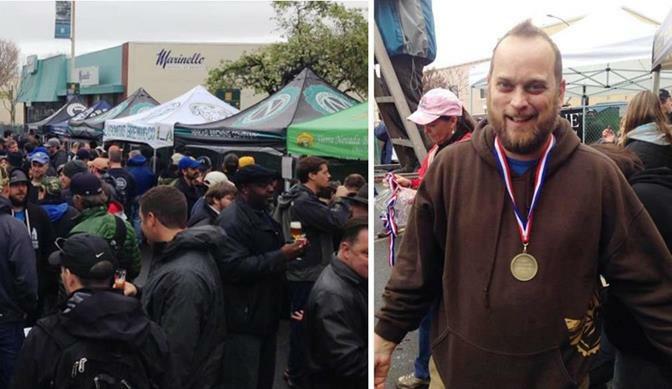 HAYWARD – Kinetic Brewing Company’s limited release Double IPA, “Afterburner,” won the Gold Medal Saturday at the Bistro Double IPA festival in Hayward, Calif.
Kinetic’s beer was in good company with 65 beers entered into competition for the top prize. This medal comes on the heels of two medals in the 2013 Great American Beer Festival, and three medals in the 2012 Los Angeles International Beer Competition. Former medalists in the Bistro’s competition include Russian River, Stone Brewing, Lagunitas, and Firestone Walker, placing Kinetic Brewing in league with modern legends of American craft beer. “We are humbled and honored by this award. There are so many world class beers here today (Feb. 8); to be chosen for any medal is amazing,” stated Steve Kinsey, brewmaster and co-owner of Kinetic. The festival’s People’s Choice award went to nearby Kern River Brewing’s “Citra IPA.” The two breweries are known to be close friends, leading to speculation of a possible collaboration brew between the local medal winners, although nothing has been officially announced. Kinetic Brewing Company opened in 2011 at 735 West Lancaster Boulevard.Read more here. The Bistro in Hayward, Calif. started its Double IPA festival in 2000, and it has become the original kickoff to the 600+ events that comprise San Francisco beer week. The Bistro is located at 1001 B Street, Hayward, CA. 1 comment for "Local brewery wins top prize at Double IPA Fest"
I reckon kudos might be in order. Now perhaps if they could be open with hours similar to a real brew pub I would award them with a real commendation. But carry on. The AV is but infantile in its growth to legitimacy and they are on the ground floor.